I have been provoked into this. A Bristolian cyclist (@sprinstar)tweeted this morning to ask if Bristol should be rated in the Copenhagenizelist of top cycling cities. A simple answer is that Bristol is too small a city to be considered for that list anyway. But the spirit of what @sprinstarwrote is what matters. It was strong provocation. Adding the mournful typogram 😦 – he concluded “sometimes I think Bristol is going backwards” and all my Bristol cycling anxiety bubbled up. “Why”, I thought “does cycling around Bristol bring out such ambivalent feelings in me?”. I have only just got here and hardly know my way round at all. But after only 3 months, for every positive feeling about how good it is for cycling, there’s a really negative experience that puts me right back into feelings of sullen frustration and annoyance. So, all the positives accepted and noted, let me set out the experiences that stop Bristol being the great cycling city that it is in my dreams. 1) Signage is maddeningly inconsistent and unreliable. This is a blog in itself. Several different bodies are involved here and so there is no obvious target to blame. Looking at every kind of sign, from road and path surface marking, through finger signs, street name signs, direction indicators, confirmation way markers, route number markings, to official mandatory, advisory, permissive and advanced warning indicators: all suffer from degrees of neglect, absence, poor visibility, ambiguity, poor placement and redundancy. Basically, a mess. Some is beautifully clear and prominent – encouraging enthusiasm and adventurous exploration. And then, gaps and vagueness appear at crucial junctions and the adventurer gets lost. Some is mystifying, some has been clearly vandalised, some is just perverse. Some is just not there. 2) Official maps are encouraging but not always very helpful. Bristol City Council has a set of cheerful and detailed leaflets showing a range of cycle routes and amenities across and around the city. They look appealing and they are sentout, or can be downloaded, free of charge. In practice they either lack required detail or else pack things so tightly together that using them on the road demands too much intuition and guesswork (maybe I’m just a poor map reader?). With poor signage, ambiguous or difficult-to-read maps are even more frustrating. 3) Physical provision is fragmented. Nothing about cycling in Bristol is free-flowing. The longest uninterrupted sections of cycling are on shared pedestrian/cycle paths – very definitely a second-best option in my book. 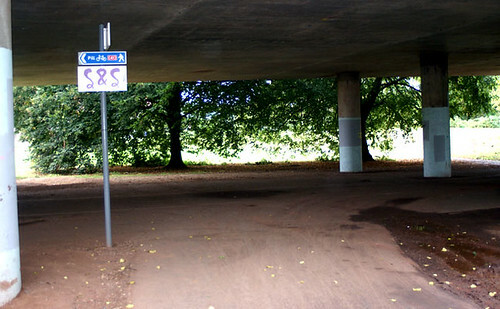 Shared paths are only trouble-free when no one else is using them. For pedestrians they can make relaxation impossible. For a cyclist they reduce the normal rhythm of a cycle journey to a forced and frequently interrupted meander. Short sections of contraflow cycle lane in one way streets (eg Nelson Street) and fragments of cycle lane alongside loading/parking places (Gloucester Road, I think) are just plain dangerous. Some unexpected bits of cycle lane within multi-lane roads, ahead of roundabouts, near the city centre demand almost suicidal courage to use at all. 4) Cycling culture in Bristol is, broadly speaking, anarchic. I don’t see any overt antagonism from motorists or pedestrians, but as a pedestrian (I walk a lot) I am regularly disturbed and sometimes shocked by cyclists in unexpected (non-legal) places. Perhaps the poor signage is to blame. But even where NO CYCLING is clearly painted in large letters across a footpath on the Downs, plenty of cyclists pay no attention. 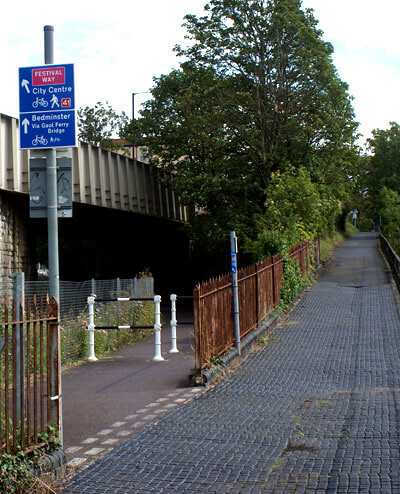 Footpaths have become a de facto set of optional cycle paths for a lot of Bristol cyclists. Many open areas in the centre of Bristol are marked on the maps as “shared” or “pedestrian”. Presumably most people have never seen the maps, because they are all treated as”shared” by very many cyclists. 5) Everything defers to the motor car. Obviously, this is not Bristol City Council Official Policy but it might just as well be. As long as so much of all our lives is taken up by ownership and use of the car, everything else that wants to move is going to have to wait. Parked cars line most of Bristol’s smaller roads, and even where parking is not allowed, parked or waiting vehicles create hazards for cyclists at regular intervals. The narrow cycle lanes that have been painted (almost never constructed) alongside roads are normally blocked at intervals along the route by a stationary car or other vehicle. Cracks and potholes are numerous. What we need to do, I think, is think before demanding the impossible or the contentious, and make more efforts to maintain and mend the things we already have. It’s good. It could and should be better. I have a feeling that if cyclists keep on asking for more, the negative aspects of what we already have will put a real drag on progress. The high level of consideration afforded cyclists by other road users (especially the hard-pressed pedestrians) in Bristol will evaporate if we can’t be more confident and considerate as cyclists. Thank you for your recent correspondence regarding the Health and Social Care Bill. A great many Bristol West residents have contacted me about this Bill and my intention is that this reply will cover all of the main points that have been raised. Most of the Bills discussed by Parliament are non-contentious and arouse limited debate. It comes as no surprise that a Bill reforming the NHS and social care has received a great deal of attention, both within Parliament and from external commentators. This particular Bill has now been under discussion for more than 6 months. Quite apart from the many representations received by MPs from constituents and lobby groups, the Bill has been the subject of major debate between the two governing parties in the Coalition Government. The Liberal Democrat spring Party Conference in March 2011 debated this issue and called for changes to the original Bill. Nick Clegg and Andrew Lansley agreed to “pause” the detailed Parliamentary scrutiny of the Bill in order to allow for more external consultation. The Bill considered by MPs over the last two days (6th-7thSeptember) is much changed from the original version as a direct result of this further discussion. On Wednesday the Bill received its approval by the majority of MPs, including myself. It now passes to the House of Lords for further debate and possible amendment. Whatever your opinion of the final outcome I hope you will agree that this long and detailed consideration by the Coalition government is a great improvement on the many examples of contentious legislation being rail-roaded through by a single party, which was my experience during the time of the previous government. I will now turn to the detailed points raised in the letters and emails that I have received. Firstly, there has been the spectre of “privatisation” or “break up” of the NHS into some model resembling health care in the USA or many EU states. I am clear that there was never any intention that this was the purpose (or an unintended consequence) of the Bill. There was never a chance that I and my Lib Dem colleagues would have allowed that to happen; I can emphatically assert that there will be no “privatisation” of the NHS and no special concessions (i.e. “cherry picking” or favourable tariffs) to private sector providers of health care. The NHS will remain free at the point of need and treatments will be paid for by our taxes. It is important to note that this does not mean that there is no role for non state owned providers of health care. Ever since its inception in 1948, the NHS has commissioned care from private doctors and companies. The vast majority of family doctors in Bristol West are essentially private professional practices which derive most of their income from the NHS. There always has and there will continue to be a mixture of providers of health care. The important point for each patient is that the treatment is paid for by the NHS, no matter from whom it has been commissioned. Another concern that many constituents have highlighted has been the role of the Secretary of State for Health. The original 1947 Act that established the NHS made the Minister for Health responsible for the provision of a comprehensive system of health care. Reforms of the NHS by successive governments have amended that duty, essentially reflecting that fact that government is usually an enabler rather than a direct provider or commissioner of services. Indeed, the current situation is that Secretary of State delegates the commissioning of health care to a network of Primary Care Trusts (NHS Bristol in our case), each with their own Board and Chief Executive. Those trusts commission health care from GPs, Hospital Trusts (mainly, but not all, state owned) and a variety of other businesses, including the private sector. Some doubt was expressed as to whether this duty of the Secretary of State was being weakened under the Bill. I have read carefully the Department of Health’s legal advice and received direct assurance yesterday from Paul Burstow MP (Lib Dem Minister of State for Health and Social Care) that the Health Secretary will retain ultimate responsibility for the provision of health care. Indeed, the duties of the Health Secretary have been widened by the Bill. Firstly, the Health Secretary must ensure that the Government is actively attempting to reduce health inequality. As Chair of Parliament’s cross party committee on Smoking and Public Health I very much welcome this new duty. Public health and the shocking disparities in life expectancies between different social groups has not been given the attention it deserves in the past. Secondly, the Health Secretary will also have a new legal responsibility to make sure that the NHS is an active participant in medical research. Bristol is of course a major national centre of excellence for several areas of medical research. Aside from the corporate status of the NHS and the duties of the Health Secretary, many people have cited “competition” and “EU regulations” as a concern. The Bill does not make any substantive change to the levels of competition for health care already in existence. The NHS has a massive procurement budget and a large number of suppliers. As such it has always had to abide by competition rules (both UK and EU wide depending on the size and nature of the contract) when it contracts out for services. The Health and Social Care Bill will not alter this longstanding situation. I would also refute the assertion that competition is an alien or evil concept in health care. Competition is about maximising patient choice and also value for money for the taxpayer. However, I do understand and agree with concerns that businesses should not make unfair levels of profit from health care. The Coalition government intends that this Bill will place important limitations on the applicability of competition law so that those charities or private firms who do bid to provide treatments should not be allowed to “cherry-pick” or undercut on matters of price. Where competition is present it will be in areas such as quality and alternative treatments, not on price for specific treatments as these come under a set NHS tariff. Furthermore, unlike the previous government, the Coalition is determined that it will not simply promise payment to such organisations regardless of whether those organisations have seen NHS patients. The last government encouraged the setting up on Independent Sector Treatment Providers, specifically to compete with NHS Trust Hospitals. There is one in Bristol, at Emersons Green. The Government believes that any disputes which occur between organisations which are involved in seeing and treating NHS patients, regardless of whether these bodies are public or private, should be dealt with by a regulator which is specifically devoted to health matters (known as Monitor), rather than the Office of Fair Trading (OFT). This is an important enhancement under the Bill, as the remit of the OFT is arguably too broad to deal with such disputes and a specific health sector regulator is welcome. Throughout the consultation on this Bill, the Liberal Democrats have sought to emphasise the importance of properly integrating local health services and ensuring their sustainability, and enhancing local as well as Parliamentary accountability. As well as confirming existing and introducing new duties for the Health Secretary, the Bill also gives much more scope for decision making and scrutiny in Bristol. A new Health and Well Being Board will be set up in Bristol and the City Council will also have new duties in public health. I believe that we will be able to build an NHS that has a strong set of legal duties on the national government, but where local health care professionals and politicians will be able to design and commission health care services that address local needs. The Liberal Democrats have made valuable changes to the Health and Social Care Bill which I believe will not only secure the future of a comprehensive system of health care but also lead to improved levels of service. The very nature of health care means that we cannot have a template of provision that can never be subject to reform or innovation. Advances in medical research and demographic change mean that we must make sure that our system of health care matches contemporary needs and circumstances. Finally, a personal note. Rest assured that I greatly value the NHS and I fully understand that many people in Bristol regard it as our greatest national institution. I have a direct personal interest in the NHS as a long term patient at one of Bristol’s main hospitals. The issues discussed in this note are as important to me as they are to you and I have given them a great deal of thought over many months. No piece of legislation can ever satisfy everyone and no doubt there is a scope for further improvement and clarification as the House of Lords now considers the Bill. I thank you for your interest in the Bill and hope that this reply has reassured you. We have made a lot of changes to the first attempt to change the NHS. There will now be no privatisation and no easy profits for suppliers. Patients won’t be asked to pay for their treatment. The NHS has always bought supplies and services from private companies. GPs in Bristol West are mostly private practitioners who work for the NHS. In a largely devolved system the Secretary of State for Health will retain overall responsibility for the provision of health care. The responsibility will include a duty to reduce inequality in health care and to require the NHS to support research. There are no important changes to the role of competition in health care provision. Profiteering and market abuse in the competitive aspects of health provision will not be allowed. A Monitor for the NHS will ensure that such profiteering will not go unchecked. Local politics will still have a role to play in NHS provision. The Liberal Democrats have helped by making changes to the first proposals. Stephen Williams MP has been an NHS patient himself, with long term treatment in a Bristol hospital. I think this is all very optimistic and I sincerely hope he is right is the implicit suggestion that the Tories have now abandoned the idea of dismantling public health provision. The Tory Election promise to do no centrally managed reform has clearly been abandoned and it is good to see that despite claims of financial crisis large sums of money can be found to provide a job creation scheme for health managers to open new offices and to move people from one desk to another. The outcomes of chaotic events can never be known – but as long as nurses and doctors and other health professionals have the will to do their best for patients (whatever nonsense is poured on them from above) we might avoid the outright scandal of US health provision and the gradual decay of the co-operative ethic. Fingers crossed eh? I’m also with Mr Williams in hoping that the House of Lords (so recently packed with Cameron’s Chums) can remedy some of the nonsense that is still in the Bill. A Bill, let us not forget, that no one voted for in the last election, for which there is no immediate need and which will soak up large sums of money that could have gone to direct use in health care itself. It is and always was, a vanity bill intended to further the libertarian cause of Big Business and the self interest of rich people. The Liberal Democrats (if what Stephen Williams says here turns out to be true) will have saved the Tories from a humiliating defeat and kept the hopes of the private health lobbyists alive.